If you had lived in Spain, Portugal or their American colonies from around 1480 until the early 1800's, your domestic habits - or rumors about them from neighbors and servants - could have led to prison, torture or death. Dr. David M. Gitlitz, a professor of Hispanic studies at the University of Rhode Island, has been analyzing verbatim testimony from the Inquisition, which held trials to unmask secret Jews. Routine housekeeping habits, he learned, did more than clandestine chanting of Jewish prayers to convict those New Christians (otherwise known as Marranos or Conversos) who continued to practice Judaism in secret. ''Cleaning and cooking became particularly important,'' he said, ''because this was the only way servants -- who tended not to be crypto-Jews themselves -- could be taught to recognize the differences.'' The Inquisition authorities posted pamphlets in town squares and read them aloud to inform the public how to spot secret Jewish practices. Dr. Gitlitz presented his findings last month at a conference held at Congregation Shearith Israel, the Spanish and Portuguese synagogue on the Upper West Side. The gathering commemorated the expulsion of the Jews from Portugal 500 years ago. Further material is in Dr. Gitlitz's recent book, ''Secrecy and Deceit: The Religion of the Crypto-Jews'' (Jewish Publication Society, 1996). Spanish and Portuguese Jews had a choice between conversion and expulsion, and many were baptised but continued Jewish customs underground, even at the risk of being burned at the stake for doing so. Even today in many Hispanic countries, some families preserve certain family traditions, often without realizing that they are vestiges of Jewish practices. In the 300 years that the Inquisition lasted, the authorities were fully aware that many Conversos were hanging onto their Judaism in secret, and so drastic measures were taken to root them out. Even candles came under close scrutiny in the courts. Since virtually every household used candles for lighting, how was it possible to distinguish regular candles from Sabbath candles? A 1491 trial in Soria in northern Spain found one woman accused of mouthing words as she lit them. In another trial, a servant claimed that on Friday at sundown, certain candles were lighted behind closed doors. In yet another, a servant reported that the candleholders in the house were regularly cleaned on Friday. Indeed, a household's cleaning routine was meticulously scrutinized at the trials. Take the odd practice of sweeping dirt toward the center of the room, rather than out the door. It was done, Dr. Gitlitz writes, because earlier generations of Spanish Jews had considered it sacrilegious to sweep dirt past the Mezuza, or sacred talisman, on the door post. A fresh tablecloth on Friday nights was similarly suspect. So was wearing a clean shirt on Friday night or Saturday. A man from Barbastro in northeastern Spain was even accused of being a secret Jew because he put out clean towels on a Friday. And woe betide the household that purchased new crockery in March or April, just before the Passover season, when Jewish law requires the use of a special, or specially cleansed, set of dishes and utensils. Testimony from a 1484 trial in Ciudad Real, in central Spain, accused a family of being secret Jews because the servants said the family used only ''plates and pots and pitchers that were brand new'' at this time of year, while eliminating leavened bread from its diet. Eating eggplant and chickpeas was yet another giveaway. ''These were recognized favorites of the Jews,'' Dr. Gitlitz said, ''the way collard greens would be identified with soul food today.'' As the Inquisitors continued to circulate pamphlets alerting people to the most likely ''clues,'' the secret Jews developed all manner of ploys. Culturally acceptable substitutes was one way out. For example, corn tortillas, which have no yeast, became a replacement for matzos in Mexico. A further dodge was to cook one kind of food for outsiders and another for one's own consumption. But even that was not always safe from prying eyes. A maidservant testified in Ciudad Real in 1484 that she had seen her mistress cook two stews on a Friday, ''one of fish in case anyone came in and one of meat for themselves.'' The meat, of course, would have been for a festive Sabbath dinner. Then there was the problem of avoiding such forbidden foods as pork, shellfish and rabbit. Some learned to take a mouthful of pork and then spit it out when nobody was looking. Others would make it publicly known that they couldn't eat pork because it gave them heartburn or other stomach upsets. A couple in Granada in 1590 claimed an allergic reaction to pork, arguing that eating it brought on asthmatic attacks. ''Defenses like these rarely convinced the Inquisition,'' Dr. Gitlitz said. Sentences would range from house arrest to public mea culpas. Burning at the stake was reserved for repeat and unrepentant offenders. Torture, primarily an investigative tool, was used in about a quarter of the cases. Still, penalties did not deter the determined. These included women who pretended to be too sick to work on the Sabbath. A maidservant told the Inquisition in Ciudad Real in 1513 that her mistress, Juana Nunez, would regularly complain of a headache on a Saturday and throw herself down on two pillows. But strangely, she always seemed to recover by late afternoon. “One should be careful to keep the entrance of their home clean, and not to spill dirty water in that area. One reason for this, is so not to profane the name of Hashem. Another reason is, because the Mazikim gain strength through this filth, and therefore one should be careful to avoid this". “The protection which the Mezuzah offers, is on the condition that one should not throw dirty objects next to the doorpost. Even if the objects are clean, one should still avoid throwing them next to the doorpost, for this profanes the Mezuzah. 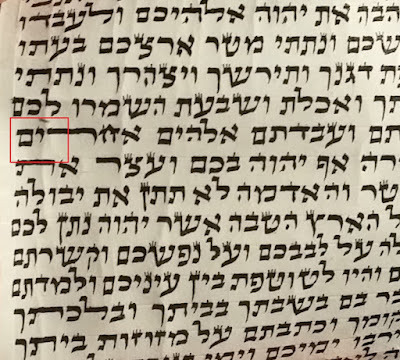 Similarly, any disrespectful object should not pass through the area of the Mezuzah for this profanity gives permission for the Mazikim to do harm, and a Bracha will not rest there. Therefore, the woman should be taught not to leave the broom next to the Mezuzah after sweeping the house. And it goes without saying, that the pails which are used for the small children to relieve themselves, should of course not be kept next to the Mezuzah. And every woman who is diligent about this issue will be blessed with Arichas Yamim”. So here you have it. Powerful words. 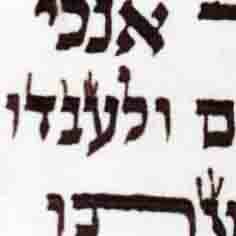 Your Mezuzah parchment itself might be in the best of condition, written by the most highly qualified Sofer. But by not properly offering the proper respect for the Mezuzah, this brings into question the whole protection factor which the Mezuzah has to offer! Having said the above - there is another aspect to this issue which is worth mentioning. It is commonplace to see many Mezuzah cases which are old, broken, and dirty. Obviously, people will be quick to stress that the main emphasis should be on the Mezuzah parchment itself, and not on the mere holder. This of course is true. 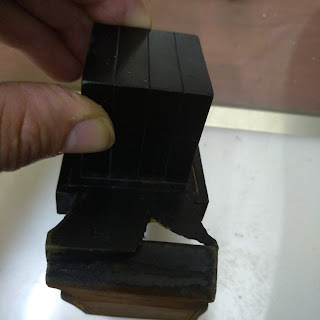 But after having clarified the necessity of respecting the Mezuzah properly, one comes to the conclusion that placing even the highest quality Mezuzah parchment into a broken dirty holder, is not so simple a matter as seems. A Mezuzah holder is not merely a "holder" as an Esrog holder is for Succos, or a Megillah holder is for Purim, where it is simply a matter of "Zeh Keli Ve'anveihu" - 'Hisna'eh Lefanav Be'mitzvos" - beautifying the Mitzvos. When it comes to the Mitzva of Mezuzah, the issue is far more serious. The issue of having holders which is not respectful, would seem to actually have a negative impact on the protection factor of the actual parchmant itself! Before Yetzias Mitzrayim, Moshe Rabeinu told Klal Yisroel: “And Hashem will pass to smite Mitzrayim, and He will see the blood on the lintel and on the two doorposts, and Hashem will pass over the entrance, and He will not permit the destroyer to enter your houses to smite”. How appropriate it is to be diligent about respecting the Mezuzah properly, especially at this time of year. For the Mezuzah is here on our doorposts for precisely the same reason the blood of the Korbon Pesach was put on our forefathers doorposts 3,000 years ago. And this is of course – to protect us from harm! We need the protection of our Mezuzahs not just merely for “Leil Shimurim” – but for all year round! Thank you for sharing. Very much enjoyed the article.